I always bring a few snacks to an annual Oscars party we attend, and for last Sunday’s party, I wanted to sort of work with a theme. I was certain it was going to be an Avatar-dominated Oscars so I was thinking ‘blue.’ I couldn’t have been more wrong, and obviously, I didn’t do so well with my Oscars betting this year, but at least this blueberry crumble tart was tasty. 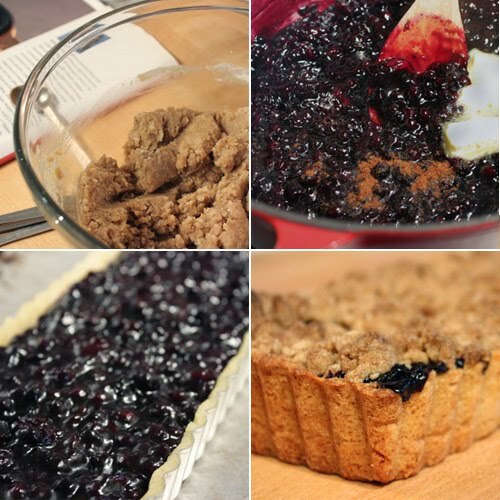 The recipe is from The Modern Baker , where it’s called a blueberry crumble pie. I wanted the cut pieces to be a simple, square form that would be easy to pick up at the party, so I baked it in a rectangular tart pan. I was also a little worried about how runny and gooey the filling would be, and to make it firmer and easier to handle, I used a little extra cornstarch. That part of my plan came together well. The pieces were easy to cut and easy to pick up without the filling running all over the place. At least that prediction worked out for me. The tart crust was made from the sweet tart dough recipe in the same book. That dough includes an egg, an egg yolk, and baking powder in addition to the butter, flour, and sugar. It was mixed in a food processor and then wrapped in plastic and left to rest in the refrigerator for 20 minutes or so. It was more dough than I needed for my rectangular tart pan, so I also made a small, free-form rustic tart to leave at home. The filling was made with frozen blueberries, sugar, a tablespoon more of cornstarch than the four tablespoon suggested, and nutmeg. After cooking and thickening, cold butter was stirred into the blueberry filling mixture. The ample crumb topping was made by combining flour, baking powder, cinnamon, brown sugar, and melted butter. Once folded together, it was left to sit while prepping the tart shell and filling. Often it’s tempting to double the quantity of a crumb topping, but I can tell you this recipe made plenty and doubling it would have been way too much. Once the filling was spooned into the shell and the crumble topping was sprinkled on top, the assembled tart baked for 40 minutes. 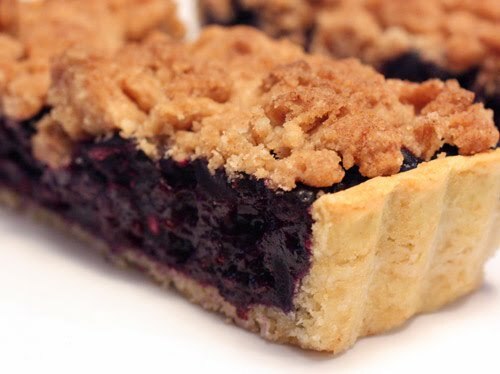 The crust was flaky and golden and lovely, and the filling was just firm enough and full of blueberry goodness, but the crumble topping was my favorite part. Those nuggets of buttery, crunchy, fun were a delight on top of the tart. It could have been almost any fruit in the filling because in the end, the blueness of it didn’t matter at all, but I’m glad that concept led me to this tart anyway. Oh my gosh - this looks supreme! I actually need a dessert for a dinner party tonight and this looks perfect. Lisa, on this dreary disgusting Seattle day I am dreaming of blueberry tart - especially one made by you. I love the look of rectangle tarts. I love that crumble topping and how thick the blueberry layer is - yum! Wow. Blueberries are so perfect for pastries! This just looks like a little slice of heave - I'd have you over daily if you lived near me! Lisa, what a great looking tart. I love the crumble topping too! I love the deep deep color of the blueberries. tasty crumble topping. Soft and crunchy just how I like it. Oh wow, my mouth started to water when I saw those pictures... the tart looks very good! Your blueberry look so perfect Lisa. Love those buttery crust. i'm so happy to see that there was no skimping on the blueberry filling--it's thick and gooey and perfect! i like the crumble topping and the fact that you adapted the recipe to be conducive to eating by hand--good stuff, lisa! Looks fab, your pastry looks absolutely excellent. It looks so yummy! I like the idea of the crumble topping, it add flavor and crunch. I love blueberries and I'm surprised about Avatar too but oh well!! I'm not sure that there's anything I love more than the blueberry. My favorite color. My favorite berry. Like that you used frozen ones, too -- which gives me hope for making this when I come to the states next. That's an intense filling. No one can say you skimped out on the fruit with this one. I just bought some blueberries last weekend for 99 cents a lb. and froze them until I could decide what to do with them. This appears to be just the thing. Now I need to buy a tart pan! Beautiful recipe and photos! If I was at your Oscars party, I would have ignored the show and focused my attention on this blueberry tart. How do you say, "delicious" in Na'avi? I would have loved to pick up a piece of this on Oscar night! It looks perfect! Mmm.. look at all this blueberry goodness! A delicious tart! Wow..I did a search on blueberry crumble since I have a load of fresh, frozen blueberries I want to use up before they die from freezer burnout and lo and behold, I was led to your beautiful blog, Lisa :) This looks spectacular..and it's the winner. That looks delicious! 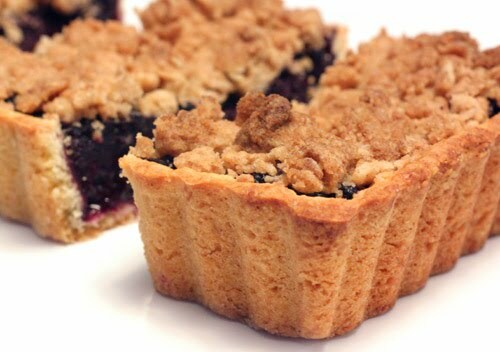 I love blueberries but you're right it is always the crumble that makes me take another piece! what a beautiful tart!!! yummy! What a perfectly delicious tart! A blueberry dream! That has to be the best and most appealing color in a tart. how beautifully done.